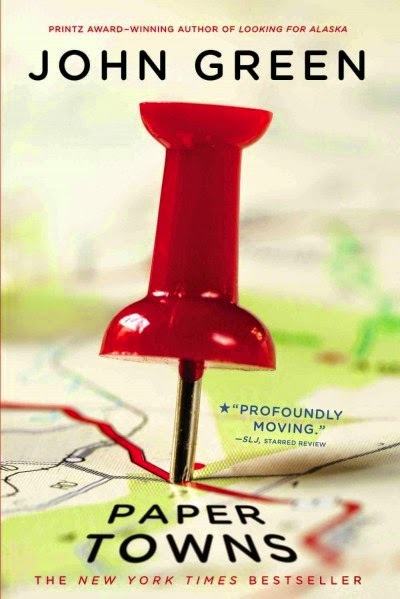 Paper Towns by John Green was first published in October of 2008, and was his third novel. With the announcement that Paper Towns was going to be adapted for the screen, following the success of the film adaptation of Green's latest novel, The Fault in Our Stars, I decided it was a perfect time to reread the book. Paper Towns follows the story of a highschooler named Quentin "Q" Jacobson and his friendship with an eccentric girl named Margo Roth Spiegelman. The bulk of the novel is Q following clues left behind by Margo after she runs away from home several weeks before they were to graduate. Along the way Q finds himself forced to reevaluate his perspective about his town, his friends, his classmates, and his idealised image of Margo. Rereading this YA novel, I immediately remembered what it was about Paper Towns that set it apart from other YA novels. There are a lot of stories in the YA literature designation that involve the idea of a quiet, nerdy boy finding the eccentric, wild, and damaged girl and "fixing" her with the power of his love; thus perpetuation the notion of female characters being present solely for the purpose of furthering the development of the male characters, without having a background or purpose to the story otherwise. This manic pixie dream girl trope is essentially the opposite of the Bechdel Test, the test determining if a work of fiction features at least two women who talk to each other about something other than a man. John Green takes the idea of Margo existing as a "broken" girl for Q to improve his life by "fixing" and pretty much smashes it into the ground. While Q is the protagonist of the story, and we are seeing everything from his point of view while Margo is physically present only at the beginning and end of the story, it becomes obvious that there isn't going to be the tearful dramatic love story ending that one might be expecting. Or that Q is expecting, since he spends a majority of the story picturing this kind of reunion with Margo. But when [SPOILER WARNING] he does find Margo at the conclusion of the book, he is given a giant reality check. Margo makes it very clear the "clues" Q was following were not intentionally left by her to be used to find her, that she in fact did not want to be found at all. When Q realises that his idealised image of Margo is not the reality of Margo, he at first reacts angrily and blames her for causing him to waste so much of his time worrying about her. It's only after Margo accuses him both of holding other people accountable for how he thinks of them and of idealising her depression into something that he could "fix" by "saving" her, that he realises how damaging (to both of them) his idolising of Margo was and that he needs to value her friendship more than the image of her he has spent so long building. John Green [END SPOILER WARNING] uses the set up of the manic pixie dream girl story to essentially and ultimately destroy the romanticised image of a troubled girl needing to be saved or fixed by a boy. And that is why I love Paper Towns. The Paper Towns movie comes out in June of this year. You can get ready by reading the book first! Available, as always, at the Ocean City Free Public Library.